I want to buy a spatula, I want to give or send them to Hostels, Hotels, or Guesthouses that have a kitchen inside the accommodations for the guest like me to use. Strangely they often to not provide or have a spatula, maybe they call them food flipper, egg turner, I am not sure, however there is a need. 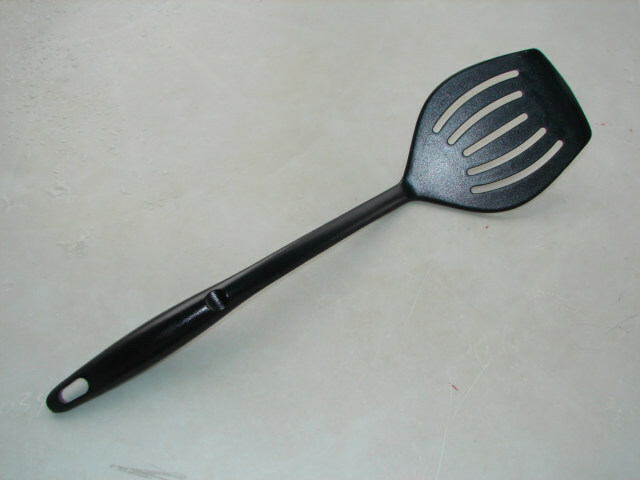 As a gesture of good will, plus as a way to promote the best way to travel, the HoboTraveler.com hope for hotels, hostels, guesthouses, I could send a plastic spatula like this to hotels, or just leave them in the kitchen. I want to have the world HoboTraveler.com printed in hopefully very durable colors on the handle. I want a white one; this is in marketing terms called a promotional item or something. I would call it cooperative advertising, a way of becoming hooked at the hip, meshed into the fabric of the business, like providing a calendar to the hotel, however this would be a more active inclusion. I hope promote the idea that a kitchen for guest does create a Hobo Home away from your home, I do think person want to feel at home, when they are traveling on the other side of the planet, very far from home.